As the European economy was just beginning to recover from the dark clouds of the economic crisis, it has been hit by another catastrophe. This time its because of the ash cloud from the volcanic eruption in Iceland that started on April 15, 2010. This has jeopardised the air travels to UK and the European countries leaving over thousands of flights cancelled. A total of 313 airports have been shut down, with more than 63,000 cancellations of flights since it began a week ago. Industry experts have pegged the amount lost of the global airline sector at around £130 million a day. The travel retail channel is counting the escalating cost of the closure of the European airspace. 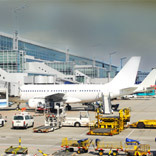 The airport commercial revenues from retail and landing costs have been hit hard with estimated loss of over several million Euros. The duty free operators like Gebr Heinemann, Aelia, World Duty Free, Nuance, Dublin Airport Authority present at the key airports that have been shut down have pocketed huge losses. The Eyjafjallajökull eruption which is likely to stay active for a while and the scare of a much bigger volcano, Katla to erupt, has sent a wave of fear amongst the travellers. This can have serious repercussions and can lead to the cancellations of travel plans and holiday bookings. In India also, the heat is being felt. Imports from Europe and neighbouring countries to India that take the aerial route have also come to a halt. In particular, the imports of items like the perishable goods and exotic fruits and flowers are disrupted. The pharmaceutical industry is also amongst the affected ones. Price hike is the direct impact that can be foreseen. “All consignments are stranded. Even though it is too early to say what the impact would be like, it should not be much. But if the problem continues, then the loss would be substantial. However, I think there would be no crisis as such,” said Mehul Choksi , chairman and managing director, Geetanjali Group. The World Retail Congress, the industry's biggest events which was going to be held in Berlin this week has also been postponed. While the intra-European mobility has been strapped, the disruption is also a blessing in disguise for some. Travellers stranded at the airports and in other countries will be making purchases in terms of accommodation, eating, drinking, and shopping as well. Though it would not be a part of their expenditures and not all would be happy to make them, the receiving end would be glad to chip in those extra pennies. Many European carriers carried out test flights during the weekend. The test run that was carried out, led just 5000 flights to take off in a day out of the total of 24000 flights in the European airspace. A call for an "immediate reassessment" of restrictions is what the outcome stated. As a result, flight operations to Western countries have begun today. However, it is yet to be analysed as to how long it will take to clear the backlog and the chaos. Hopefully the whole cycle that had come to an end will revive within the coming days with the losses being incurred. However, with fingers crossed for halt of further expected eruptions.